The Kansas-Nebraska Act of 1854 created the territories of Kansas and Nebraska and opened new lands for settlement, and allowed the settlers to decide whether or not to have slavery in their state. The new Republican Party, formed in reaction against allowing slavery where it had been forbidden, emerged as the dominant force throughout the North. The act was designed by Democratic Senator Stephen A. Douglas of Illinois. While not repealing the Missouri Compromise of 1820, the new law did deem it "inoperative and void". The act established that settlers could decide for themselves whether to allow slavery, in the name of "popular sovereignty" or rule of the people. Opponents denounced the law as a concession to the Slave Power of the South. The act and the subsequent civil war in Bleeding Kansas was a major step on the way to the American Civil War. The act divided the region into the Kansas Territory (south of the 40th parallel) and the Nebraska Territory (north of the 40th parallel). The most controversial provision was the stipulation that each territory would separately decide whether to allow slavery within its borders. This provision nullified the Missouri Compromise of 1820, which had prohibited slavery in any new states to be created north of latitude 36°30' since Kansas and Nebraska would be north of that line and could now choose to allow slavery. Pro-slavery settlers rushed to Kansas mainly from Missouri. Their influence in territorial elections was often bolstered by resident Missourians who crossed the border into Kansas purely for the purpose of voting in such ballots. They were called border ruffians by their opponents, a term coined by Horace Greeley. John Brown and his sons helped in the fight against them and killed five pro-slavery farmers in the Pottawatomie Massacre. (John Brown also helped defend a few dozen free soil supporters from several hundred pro-slavery supporters at the town of Osawatomie.) Successive territorial governors, usually sympathetic to slavery, attempted unsuccessfully to maintain the peace. The territorial capital of Lecompton, Kansas, the target of much agitation, consequently became such a hostile environment for free-soilers that they set up their own unofficial legislature at Topeka. The hostilities between the factions reached a state of low-intensity civil war which was extremely embarrassing to Pierce, especially as the nascent Republican Party sought to capitalize on the scandal of Bleeding Kansas. The routine ballot-rigging and intimidation practiced by pro-slavery settlers failed to deter the immigration of anti-slavery settlers who won a demographic victory by winning the race to populate the state. The pro-slavery territorial legislature ultimately proposed a state constitution for approval by referendum. The constitution was offered in two alternative forms, neither of which made slavery illegal. Free soil settlers boycotted the legislature's referendum and organized their own which approved a free state constitution. The results of the competing referendums were sent to Washington by the territorial governor. President James Buchanan sent the Lecompton Constitution to Congress for approval. The Senate approved the admission of Kansas as a state under the Lecompton Constitution, despite the opposition of Senator Douglas, who believed that the Kansas referendum on the Constitution, by failing to offer the alternative of prohibiting slavery, was unfair. The measure was subsequently blocked in the United States House of Representatives, where northern congressmen refused to admit Kansas as a slave state. Senator James Hammond of South Carolina (famous for his "King Cotton" speech) characterized this resolution as the expulsion of the state, asking, "If Kansas is driven out of the Union for being a slave state, can any Southern state remain within it with honor?" The Kansas-Nebraska Act split the nation and pointed it toward civil war. It is commonly acknowledged as the beginning of the Antebellum period of American history. The act itself virtually nullified the Missouri Compromise of 1820 and the Compromise of 1850. The turmoil over the act split both the Democratic and Know Nothing parties and gave rise to the Republican party that soon controlled most of the northern states. Eventually a new anti-slavery state constitution was drawn up. 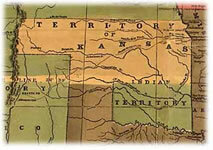 On January 29, 1861, Kansas was admitted to the Union as a free state. Nebraska was admitted to the Union as a state after the Civil War in 1867.